Our couples frequently ask us for sample photos from each of our San Francisco photo tour locations. 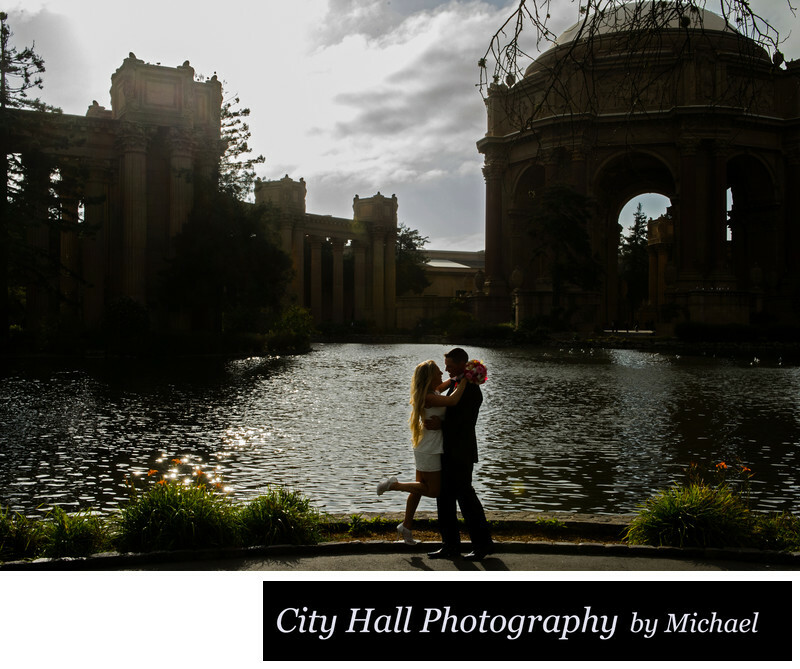 The Palace of Fine Arts is a favorite location of ours and it also seems to attract many of our out-of-town brides and grooms. Tina and Damian booked our "San Francisco Package" and this was one of our stops. A fun loving couple, they let Toni and I know from the very start that they were "up for anything". In other words, the more creative and fun the pose, the better. We had a great time with them and that's really the goal of our San Francisco Photo tour. Fun times and memories to last forever. After spending some time in the back of the Palace of Fine Arts in the Rotunda area, we made our way back to the front. This area is where you see some of the more iconic wedding photographs taken at the Palace. We try to include the fountain in some of the photos when we can, but sometimes we have to work our way through the crowd. On this particular day, sunset was coming on fast so we were able to get some nice pictures with a very low sun position. Very romantic! 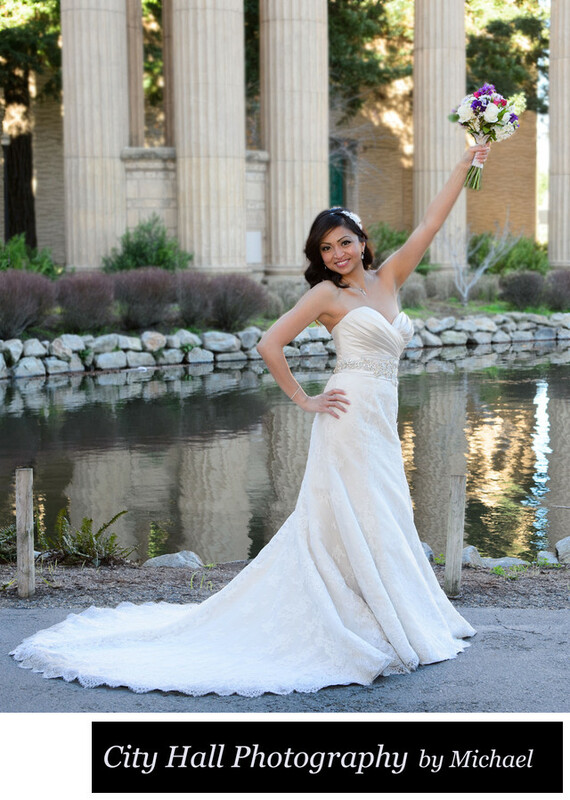 April was another fun and beautiful bride we worked with at the Palace of Fine Arts. We spent a good hour touring around the buildings and grounds at this San Francisco landmark (below left). This happy couple was really interested in exploring all the nooks and crannies of this historic building. We took them all of our secret and not so secret locations at the Palace. Leo and Nadya wanted romantic shots at the beautiful Palace of Fine Arts. As you can see from the photo (below right) they made it quite easy for us. The Bride especially had a knack for posing for the camera in a dramatic fashion. 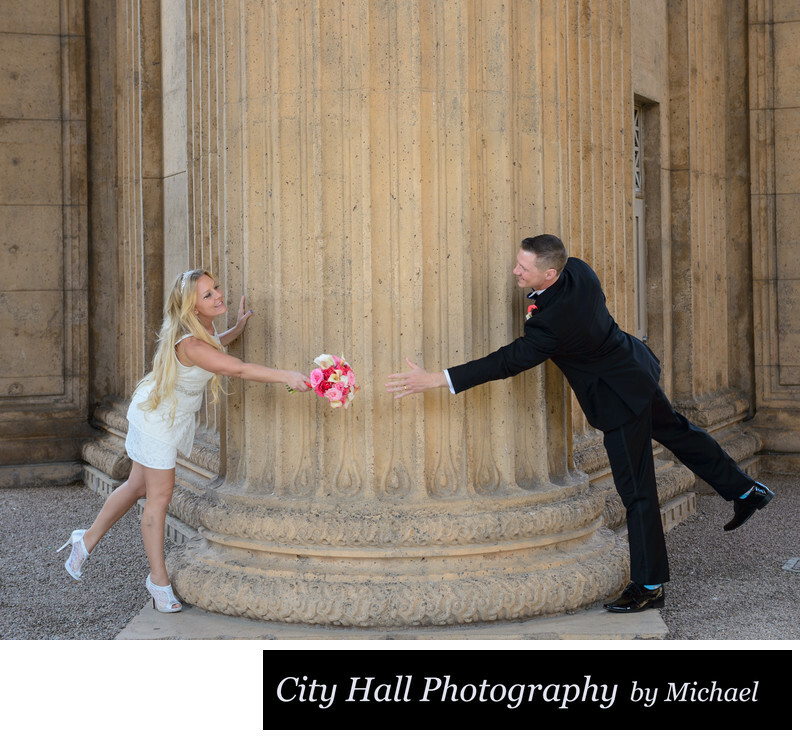 We really had a great time with them after their City Hall ceremony. They were another couple that wanted to try a multitude of locations a the Palace of Fine Arts and all kinds of different and creative poses. George and John sharing a private moment in front of the amazing backdrop of the Palace of Fine Arts in San Francisco. Sometimes the best photos are created by the couple and not the wedding photographer. For the photo below, we just asked our LGBT couple to sit down in front of the building and interact. We wanted to get some nice candid looking shots of the couple enjoying the moment. I love the colors in the background, especially the San Francisco sky. But most of all, I like the natural feeling that this image portrays. Yes, there are a great many tourists and other wedding photography going on at the Palace, but if you are patient and know where to take your newlyweds, you will be rewarded with captures like this one! We took the photo below just before sunset and it created a semi silhouette of Damian and Tina. A gorgeous time of the evening at The Palace of Fine Arts. Depending upon the time of the year, we can arrive at certain locations just around sunset after your city hall wedding celebration. Let us know in advance if you would like to plan the best time to have your wedding ceremony to optimize photo opportunities. The light at San Francisco City Hall can be variable depending upon the fog. Of course the fog is a bit of a risk for trying to create sunset photos, but we can always try and who knows what may come of it. Something unexpected! 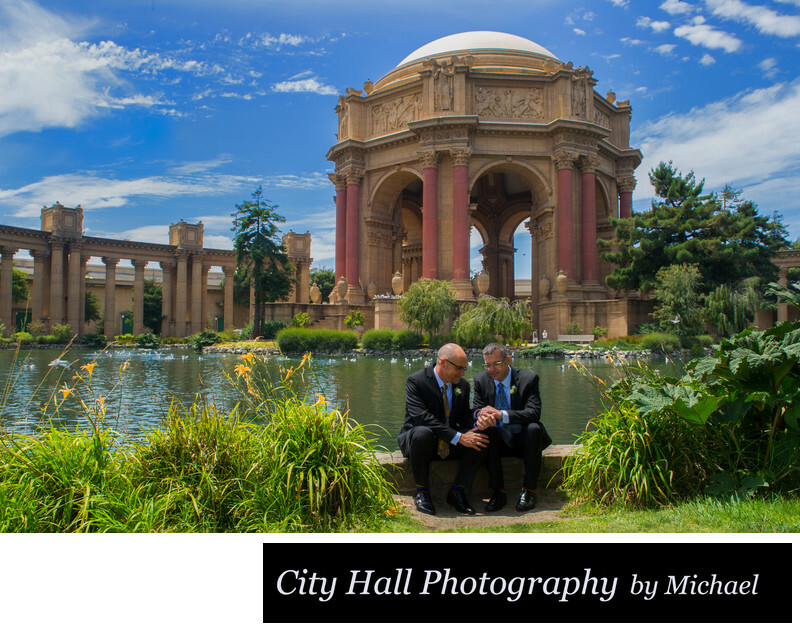 Did you know that you can actually have your wedding ceremony at the Palace of Fine Arts? Many people are not aware of this but you can reserve the Rotunda for 1 or 2 hours any day of the week and get married right here. During your ceremony they will rope off the Rotunda area to keep the tourists and photographers out. It is a beautiful venue and one that we have photographed a number of times in the past. They also set up chairs for your guests and make the Palace into a very nice spot for your ceremony. 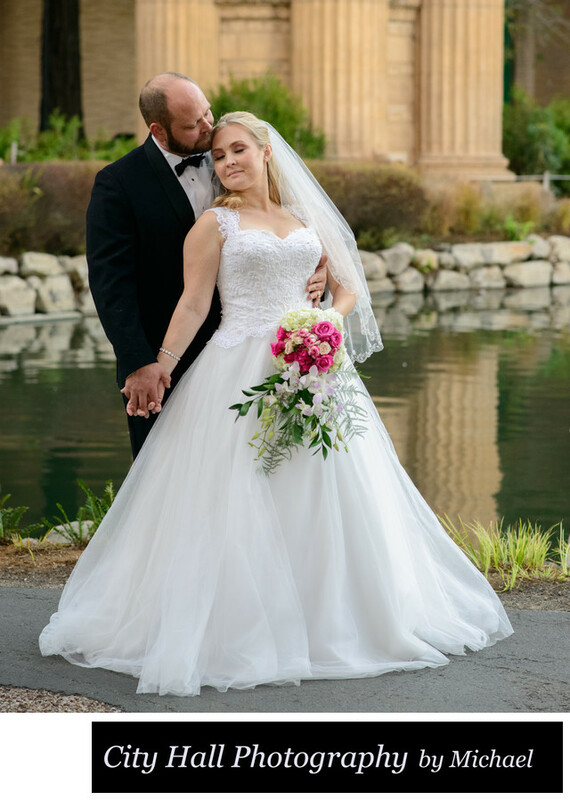 Of course, after your ceremony you have the option of having your San Francisco wedding photographer take you around the grounds to capture some more memories. For more information on how to reserve your San Francisco wedding here, click this link.